We got a new couch this past weekend, well we picked it out, designed the shape and chose the color (a grey), ordered it and now, we wait. It'll take ~6 weeks to receive. Patience is not my strong suit. 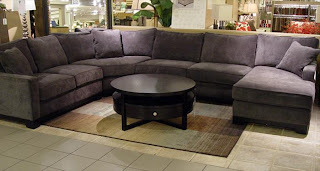 Ours is a very slightly a lighter grey color, and the "L" of the sectional is on the right side with no chase (even though I REALLY wanted a chase...our room is not conclusive to two sides jetting out). Anyways - this couch picture and the one we got is by Jonathan Louis at Nebraska Furniture Mart. This is a great brand because you can design the sectional you want - big, small, curved, straight, bottom choices, arm type options, etc. And there are tons of colors to pick from. There were like 10 greys alone.